WHEN fatigue becomes unbearable for Kirsty Stevens, she doesn’t take a nap. Instead, she reaches for her colouring pencils. Now, the designer from Fife hopes to help others with multiple sclerosis by launching a colouring book. And she’s using the MRI scans that highlight the damage MS has caused her brain to inspire her patterns. “I love that I’m making something creative and beautiful out of this horrible condition that I have for life,” said the jewellery and textile designer. “Colouring is relaxing and good for mindfulness, so I thought it could really help for people with MS or a similar condition. The 32-year-old was diagnosed 10 years ago while studying jewellery and metal design in Dundee. She hopes her new project will help to raise awareness of the condition and help people with MS cope with their symptoms. “I took a year out from university thinking my life was over but I soon learned it’s manageable,” said Kirsty. “The main way it affects me is extreme fatigue. It’s horrible and overwhelming. When it hits, I struggle to get any work done. Determined to put a positive spin on her diagnosis, she turned the outlines of her MRI scans into beautiful, empowering patterns for her jewellery and textiles. Now Kirsty has created intricate designs for a new colouring book, an activity that has recently grown popular with adults. “I was doing lots of linear prints and thought they’d be great to colour in,” she said. Kirsty believes colouring can also help people with MS by offering a distraction from pain or fatigue and reduce stress, which can exacerbate these symptoms. “For me, fatigue can be brought on if I’m stressed, upset or anxious. This just slows everything down and mellows me out,” she added. Kirsty has been working on the designs from her home studio in Falkland, Fife, and now plans to approach potential publishers.She also hopes to develop an app or online version that will let people fill in colours using their finger or a mouse. “Some people with MS can’t hold a pencil, so I want to do a digital version so everyone can enjoy it,” she added. 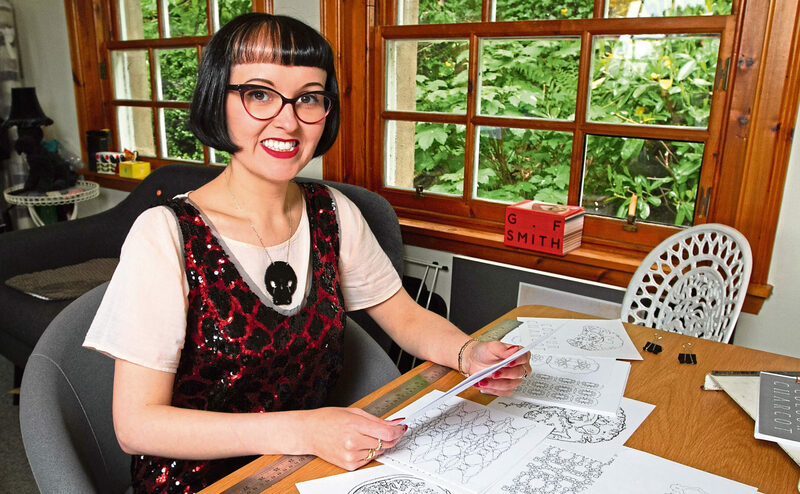 Kirsty donates a percentage of the profits from her jewellery and textile sales to the MS Society Scotland and plans to do the same with her colouring book. Ahead of World MS Day on Wednesday, she is quick to praise the organisation, which named her an MS Champion earlier this year. Morna Simpkins, MS Society Scotland director, said: “Kirsty’s colouring-book project is an exciting and creative way to provide people living with MS a therapeutic activity. Kirsty also hopes her book will have universal appeal and help start a conversation about living with MS.
“MS is very misunderstood and I think my designs allow people to openly ask questions,” she added.